A mine is not only a source of economic resources, or a place where to dig mineral specimens. A mine is an unique opportunity to study and understand our planet, not only from a geological point of view. Also, a mine can teach us about Life. On Earth, Life and minerals are linked since the very beginning of Life to now. Apart of Humans, the higher power to transform the environment lies in the Prokaryotes (Bacteria and Archea). Our life depends on the Prokaryotes. Even the air we breathe was oxygenated by ancient prokaryotes more than 2 billions years ago. Also, these small organisms can transform rocks and minerals and they generated mineral deposits we benefit. A nice example of the relation between Prokaryotes and minerals are some deposits in the Iberian Pyrite Belt (IPB). Among the deposits in the IPB, for me the most interesting is the recent Las Cruces mine (Gerena, Seville). Las Cruces benefits a huge copper enrichment zone, with high concentration of secondary copper sulfides, mainly Djurleite, Chalcocite and Digenite. This enrichment zone yielded also spectacular Chalcocite and Djurleite crystals. Overlying this copper sulfide zone, the mystery begin: Instead of a gossan, similar to others IPB deposits (as Tharsis), a zone of a previously undescribed rock formed by siderite and galena cover the deposit. As a scientist, one of my interests is the Life-Mineral interaction and I am involved in a research team which spent years studying these rocks at Las Cruces. Now our results have been published by the prestigious journal Nature Communications. What we found are evidences of a giant ecosystem composed by extremophile organisms in a oxygen-free buried environment and at moderate to relatively high temperature. This occult ecosystem "breathe" the sulfate and its metabolic residues, carbon dioxide and sulfide, transformed millions of tons of an original goethite gossan by sulfidation and carbonation. This lead to a new rock composed by biogenic siderite and galena, with occasional silver minerals and gold. This process took place in recent times and is active now. Our model suggests that exists buried, occult ecosystems (in this case at a depth between 150-200 meters) capable to transform millions of tons of minerals by means of "exotic" metabolisms from our point of view. From a mineralogical point of view, this biogenic rock shows very interesting features. One of the most important is the first evidence of organisms fossilized in galena. 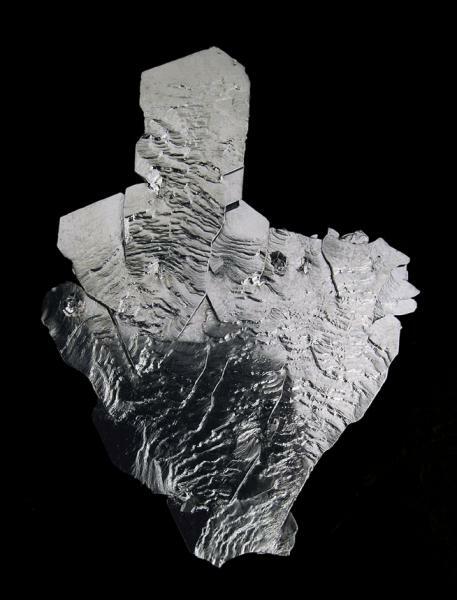 Also, very interesting proustite specimens, diverse galena pseudomorphs, weird galena habits and other minerals could be found in the so called "black rock" of Las Cruces. An unique and beautiful mine. Otherwise indicated, the pictures are property of C. Menor-Salván. Good specimens of Djurleite were rescued from their fate in one of the high quality copper metal plates produced by the mine. 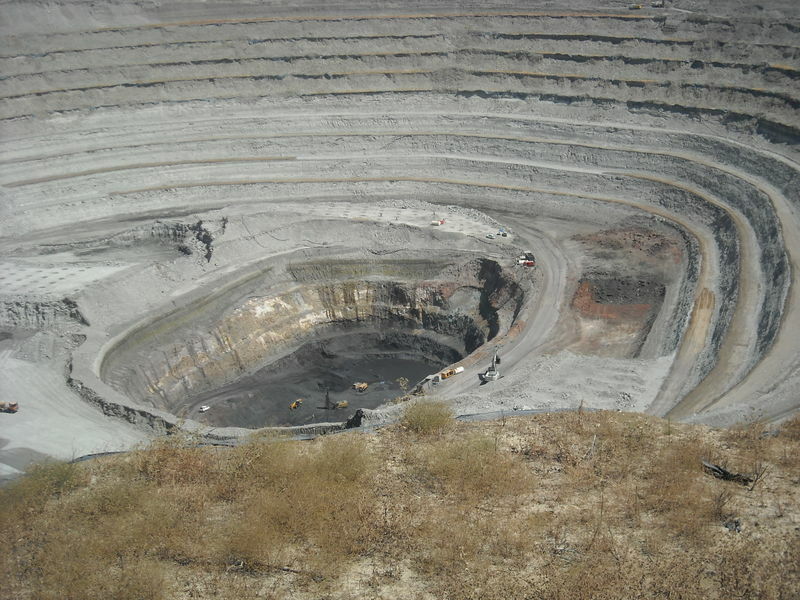 Las Cruces mine in 2010, during the first stage of the extractive workings. Proustite on fine grained and muddy biogenic Galena. A beautiful picture by Jean-Marc Johannet. Very, very interesting. If I understood this right, this biogenic processes are recent? What is the original age of the mineralization? 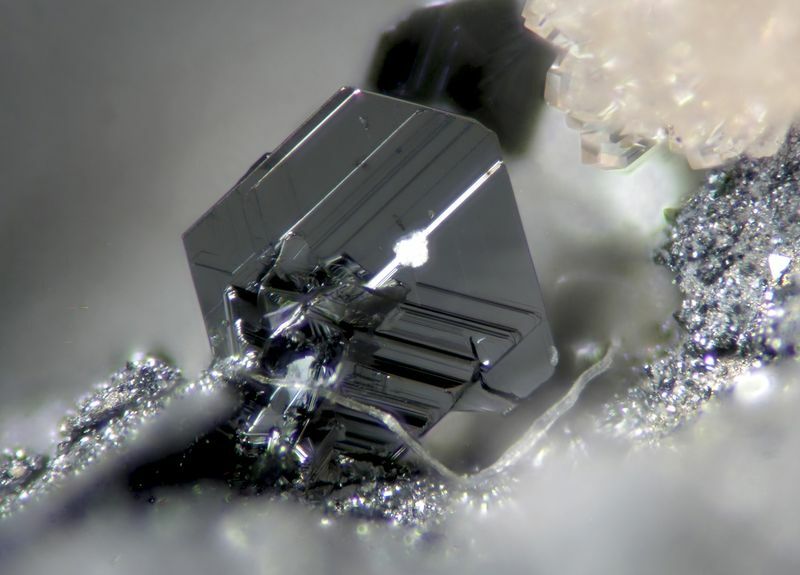 For me, it is amazing how the biological activity generated several million tons of a black rock formed by nearly pure galena with silver minerals, transforming and concentrating the lead and silver from the original gossan. It is interesting, for example, the presence of frequent galena pseudomorphs after mimetite. Moreover, the Las Cruces mine benefits a rich cementation zone with a copper concentration never seen before. 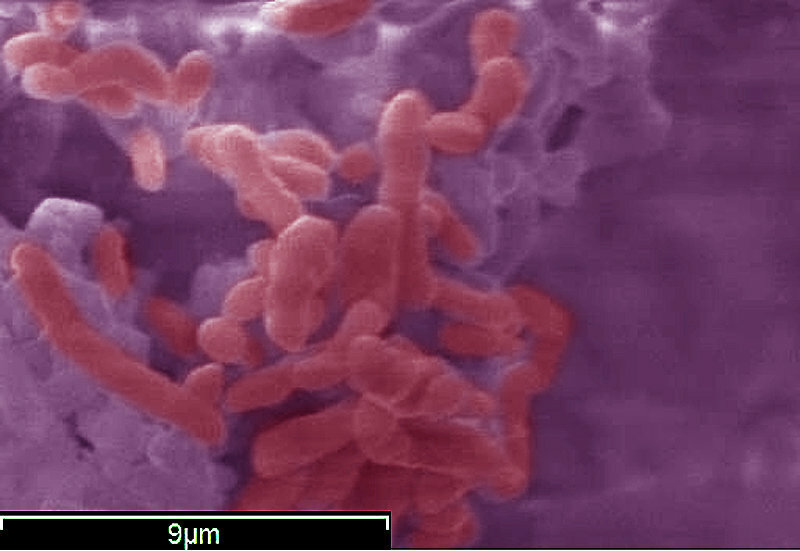 We think that before the bacterial activity, the deposit was similar to others in the IPB, such as the Tharsis mine. Relicts of original gossan (yellow) in a zone not completely transformed. The black-grey zones are composed by fine grained galena and siderite. 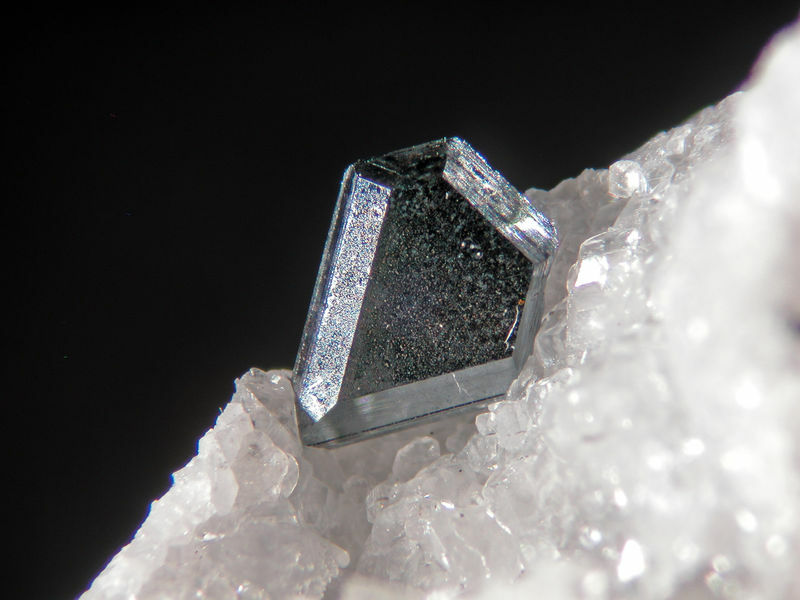 Pseudomorph of galena after mimetite. 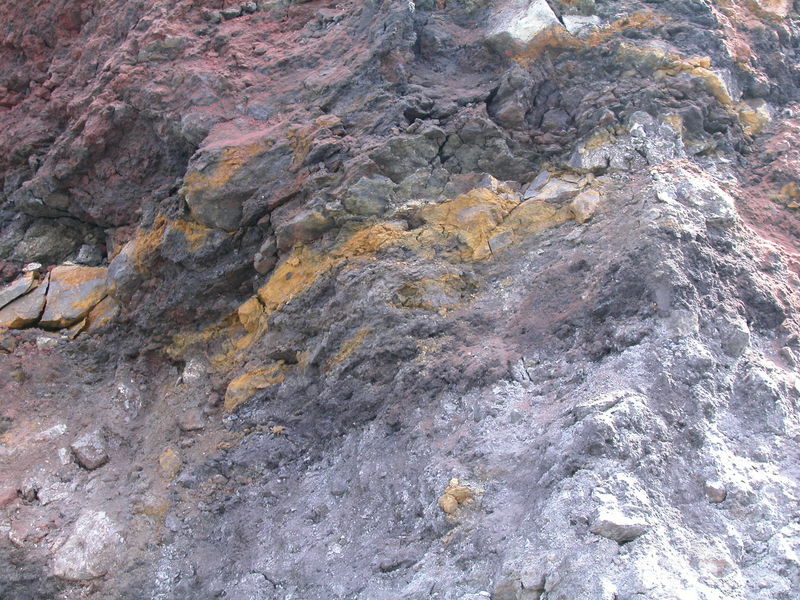 The presence of frequent pseudomorphs are evidence of the sulfidation suffered by the original rock. Moved to the Featured Columns of FMF section. To know more about this section please read: What is "Featured Columns of FMF"? Really fascinating! Did you find living Prokaryotes (Desulfobacterales, etc.) in the mine? The two images with the Proustite crystals showing, that the Galena is younger than the Proustite. 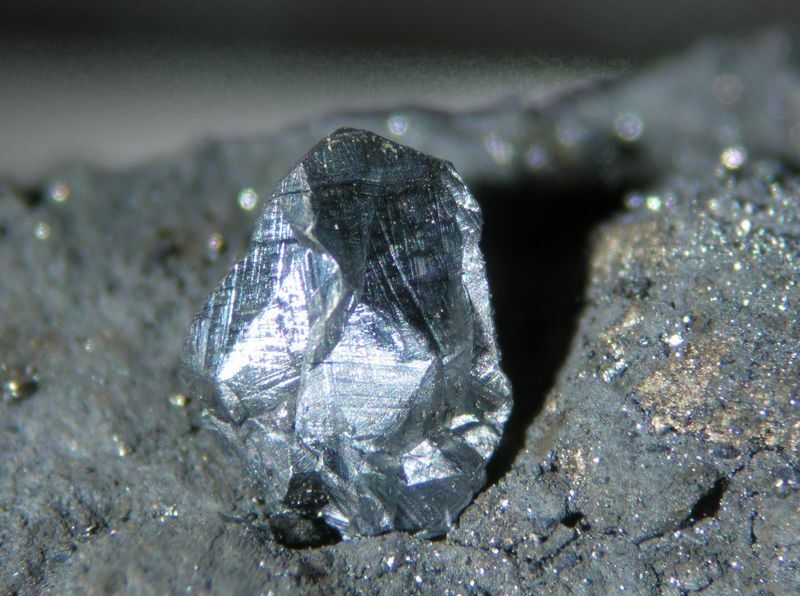 The image with the Djurleite shows, that Djurleite is younger than the Galena matrix. In this case, there must be a hydrothermal activity to build up such big crystals. Yes, the recent extracted mineral and the underground water in the mine is full of living bacteria. Now, other research group more specialized in extremophiles and mine bacterial communities are working on it. 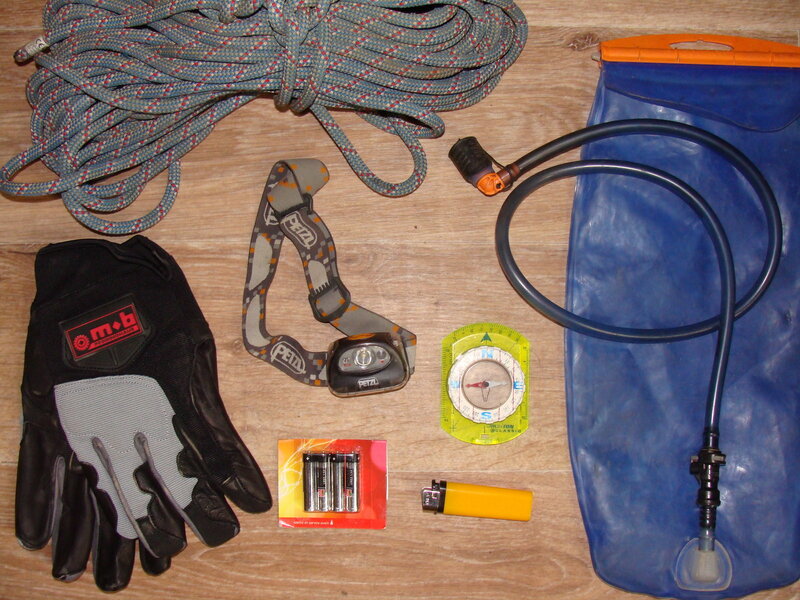 The mine of Las Cruces is really complex. My depiction is very simplistic, but the structure of the mineralizations contains other features. 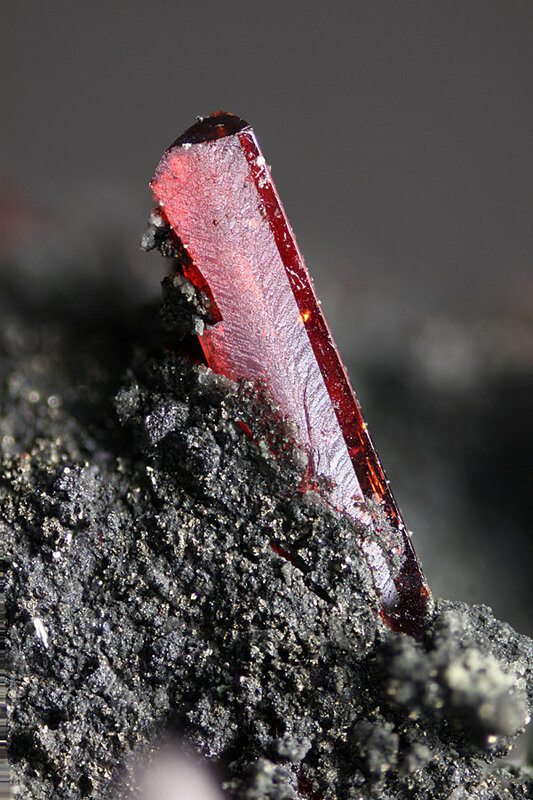 For example, several episodes of hydrothermal activity remobilized and recrystallized some minerals. Thanks to these hydrothermal veins we have the beautiful chalcocite specimens we found. The djurleite is not on galena. The copper sulfides appear on the cementation zone, a zone formed by nearly pure copper sulfides. In the picture, the djurleite crystal is on secondary copper sulfide (djurleite+chalcocite+digenite + other minor copper sulfides). Apart of the scientific papers, I have a paper in preparation about Las Cruces, more divulgative and descriptive. I think that we should share the mineralogy and science we learned in this awesome mine. 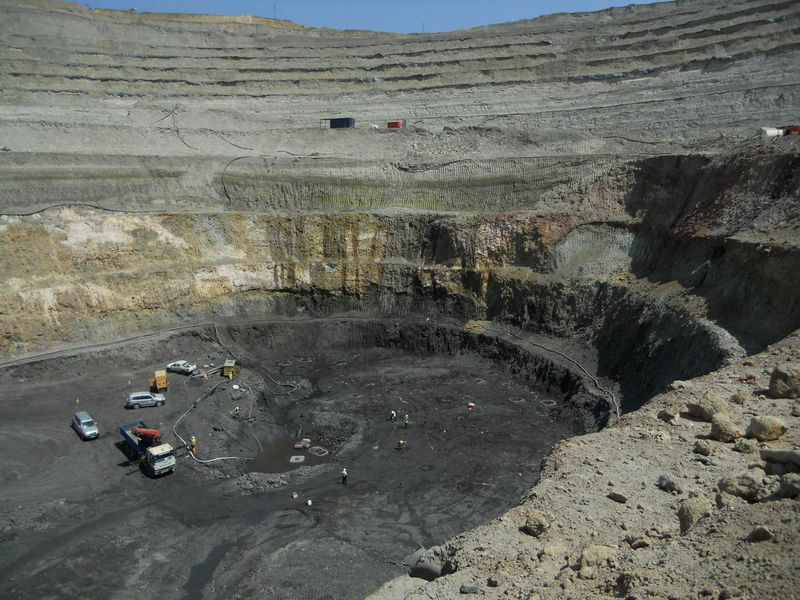 The open pit in 2010. The black material in the bottom is secondary copper sulfide. At right, the biogenic zone. All the system was buried under 200 meters of marl. Thank you for clarification about the paragenesis of the Djurleite. What an amazing discovery, and kudos to the mining company for allowing this research during extraction. I recently read a book by Robert Hazen called "The story of earth" which puts out a theory that evolution of life could not have occurred independent of the evolution of complex chemistry; therefore the complexity of mineralogy on earth could not have occurred on a lifeless planet. I know it's more complicated than that, but to see evidence that the transformation isn't confined to ancient geologic history is amazing. I have some galena/proustite specimens from the Imiter Mine in Morocco with the fine grained galena that I can't help but wonder about now. If there area similar studies from that location I'd love to know about it. You summarized a part of my research work. Indeed, some of us think that the chemical evolution and the origin of biochemical systems are linked to some minerals and its transformations. For example, I observed that pyrrhotite transformation in pyrite could be connected with some simple biochemical reactions. And some experiments suggests that the tiny iron sulfide "crystals" (similar to mackinawite, pentlandite and other sulfides) that all living beings use to maintain the cellular energetic machinery are, as hypothesized, possible "living fossils" from the origin of Life period. 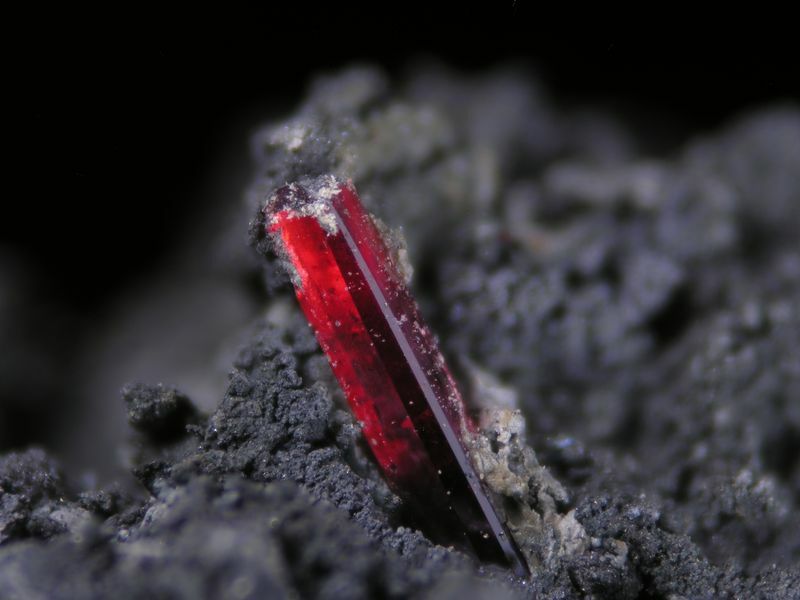 This connection between Life and Minerals have been maintained during all evolution. The organisms transforms minerals and generates new ones. Without Life, all our entire geology and mineralogy is incomplete. 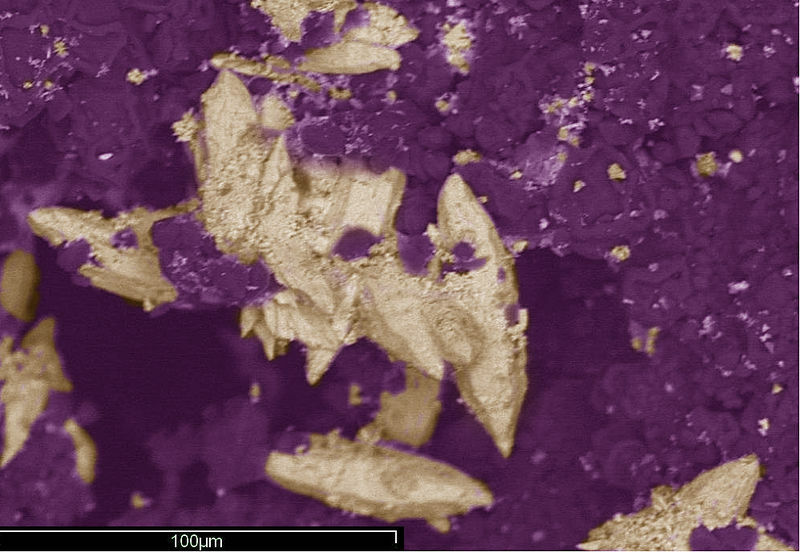 We studied the role of living beings in the origin of the mineral deposits in the Iberian Pyrite Belt, but these processes could be extended to other deposits. I have some galena/proustite specimens from the Imiter Mine in Morocco with the fine grained galena that I can't help but wonder about now. If there area similar studies from that location I'd love to know about it. . The study of the connection between ecosystems and mineral deposits practically just begun. Some massive sulfide deposits could be linked to biological activity, and the formation of supergenic minerals could be related also with biological communities. I think this is not the case of Imiter, an epithermal vein system associated to volcanism (if I remember well, I am not an expert in Imiter).